I have spoken before about the Chakra points on the body – the energy centres that link our physical, mental and spiritual aspects together, and indeed there is a section on the website that explains the Chakras, from the Root Chakra to the Crown. Now I would like to discuss the Hara line, and the further energy centres aligned with this. 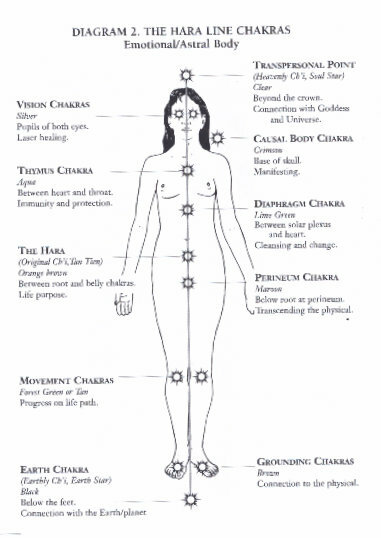 The Hara Line Chakras are located in between the major chakra points, along the central line of the body, and I am noticing them more during my Reiki healings. Outside of the body, above the head and below the feet are the Transpersonal Point and the Earth Chakra, respectively. These relate to heavenly Chi and Earth Chi: the energy that we draw in to our bodies from outside of us. When we draw the energy in, down our bodies from the head, this is Universal Heavenly energy, and it is light, clear, and quick-flowing. When we draw energy in, up from the ground, this is grounding or earthly energy, and it is heavier, black, and slower moving. Working from the top down, at the base of the skull is the Causal Body chakra and is crimson. It is linked with manifestation. This does not yet seem to be fully open and is what I would call expectant: it is there, but is not strong and does not seem to have much impact yet. Next, between the Throat and Heart Chakras is the Thymus Chakra, and is turquoise. It is linked with immunity, and therefore health and protection. This chakra in particular on the Hara line appears to be quite strong, or perhaps open would be a better description. It seems to attract a lot of Reiki energy. It is also known as the High Heart and spiritually it is linked to joy, peace, contentment, connection to humanity. Next is the Diaphragm Chakra, and is lime green. It is connected to purging toxins, as well as old emotions. Located between the Heart and Solar Plexus Chakras, it links ego/self-will Solar Plexus with self love and compassion Heart. Thus, fully opened, it will open us, the person, up further to knowing and bringing into our lives only that which is good for us. After this is the Hara itself, also known as the Tan or Dan Tien. This is the seat of original Chi and has been known in the east for a long time, especially in such disciplines as Qigong. This is where energy is stored, where we are balanced and is perhaps the most important Hara line Chakra because of this. It is also the strongest. I believe many healers instinctively know about the Tan Tien – for example, I naturally held my hands flat on my belly, in a diamond shape around my navel when working with energy- around the Tan Tien. This is where I feel the energy gathering, and always have done, even before I knew about this energy centre. It is also a comforting place to hold the hands. When the Tan Tien is active, our energy store increases, we can hold more Chi. It also easily connects – and holds – the earth chi and the heavenly chi as they move through the body. This is where the three forces gather and spread outwards; our own energy, heavenly energy, and earth energy. For me personally, obviously the Tan Tien is extremely active, and is where I always start with self-Reiki, feeling the energy gathering there before I move on to the major chakra positions. The Thymus chakra too seems very active, and is a chakra point I have found myself unintentionally activating – such as nearly-falling asleep with my hand directly over the Thymus chakra, and feeling the Reiki energy flowing, even though I had not intended to do a Reiki self-healing. I have also sensed this chakra when working with clients. If you work with energy, or meditate, try meditating on the Thymus Chakra to activate it, and sense what it means/feels/sends to you.Heidi. via The Hara Line Chakras – Reiki Heidi: Reiki Healing in Norwich. via The Hara Line Chakras.